WOKING’S players will swap the Costa del Sol for Staines-upon-Thames this Saturday as their preparations for the 2015/16 Vanarama National League season begin. Today’s friendly over at Wheatsheaf Park (3pm kick-off) marks the first of five scheduled pre-season looseners for the Cards, who will be looking to start the new term in the kind of form in which they finished the last, as they raced up to seventh place in the final standings. 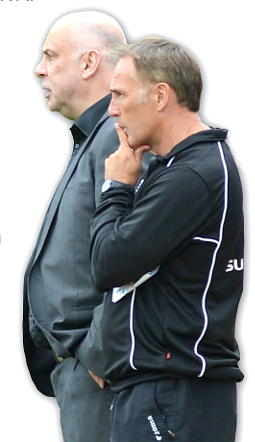 As well as giving their existing squad a chance to blow out the cobwebs of those lazy days by the pool and the odd extra scoop of ice cream over the summer break, Woking management duo Garry Hill and Steve Thompson (below) will also be running the rule over a number of trialists hoping to join the ranks for the upcoming campaign. There is just over three weeks until Hill and Thompson board the bus to Merseyside for an enticing season opener against Non-League newcomers Tranmere Rovers on Saturday, August 8. Talk on the terraces, though, is that the much anticipated clash is set to be brought forward to fill the first Friday night TV slot of the season before the BT Sport cameras – in what is Cards’ first trip to Prenton Park since 2006. Back to Saturday’s rehearsal, and Staines manager Nicky Forster, like his Cards counterpart Hill, will be looking to mould a squad equipped for a tilt at promotion after the Swans were relegated from the National South division to the Ryman Premier League last season. Despite there being two leagues between the teams now, it wasn’t so long ago that these local rivals were both battling it out to climb out of the regional Conference division. Most recently the pair met at the Wheatsheaf for a warm-up game two years ago, when the hosts ran out 3-2 winners on a sweltering July day that saw John Goddard and the recently departed Josh Payne feature for the first time in a Woking shirt. Next week the pre-season schedule sees League Two club Portsmouth sail into town again. These two historic names of English football last met in a mid-season practice match in February, when the likes of former England international Nicky Shorey took part in a 3-1 win for the Cards. Special hospitality tickets for this prestigious friendly tie are available for the Geoff Chapple Lounge at Kingfield: an adult ticket costs just £10 and includes fish & chips and drink, plus access to the newly installed leather seats in the Leslie Gosden Stand – please note that the usual entry fee is still required at the turnstile: £10 for adults, £5 concessions, and kids go free. LOOKING even further ahead, and Woking have also announced that the club are expanding their Centre of Excellence to include boys from the under-9, U10 and U11 age groups for the 2015/16 season. An open trial is taking place on Wednesday (July 22) at 9am – contact Club Development Manger Scott Harrison on scottharrison.academy@wokingfc.co.uk for more info.